The cover of this book is really what caught my attention. I love it.The colors, the vintage-y vibes, the graphic design. On point. And, obviously, New York City. Heart eyes forever for that city. But this book highly disappointed me. Here's why I gave it 2 stars. 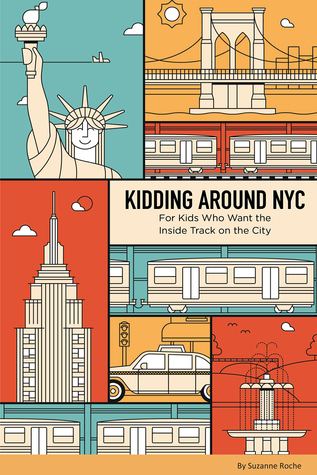 Kidding Around NYC is a very short book dedicated to children, families and everyone with a child who want to visit New York City. It is full of suggestions and historic explanations about the most famous buildings, museums and places. There were not only historical facts, but also fun ones and entertaining questions to actively interact with children. They are in fact the targeted audience, but I don't believe a child would be interested in reading this if not with a parent, tutor or family member by his side. I'm thinking about age 4 - 7, but probably an older age would be more suitable for this. In fact, most historic descriptions should need a further explanation in my opinion when read to a child. Of course, I'm no expert in the educational aspect, however I am talking about my own experience with my childhood and with other children. I would love to read something like this to my younger cousins, but the visual aspect isn't well thought. Children are usually drawn to figurative details, colors, images and interactive texts. And I found out this book wouldn't suit those needs. I would have expected more images and some bigger ones, most pictures in the book were quite small and badly positioned in the overall layout. The lack of a variety of colors was crippling and in the long term could bore a young reader. The layout needed improvement too. The text and images didn't go well together in terms of visual appeal. The graphic aspect should have been better done. I liked the fun facts and other interactive questions, but I personally would have placed them in a different way and highlighted them for sure. I loved the questionnaire about the Museum of Modern Art, but it looked like it was a thing on its own and not part of the book. I am not sure if I am making sense or not, hope you understand what I am trying to say. One of the positive aspects was the writing. It was fun to read and a pleasure too. You can really feel the author's relationship with New York City. It made me smile and it was really interesting too. It could get a bit boring after some time, but I appreciated it anyway. But the writing was badly highlighted with a weird colored frame. I quite disliked the colors chosen and it really put me off while reading. In a fewer words, this book could have been a lot better if it was done in a different way. A funner layout, more appealing colors, better highlighted fun facts and tests. And maybe even a consultation with an educator couldn't have hurt by the way. I know this review is quite short, but the book itself is. So I have no other interesting things to say at the moment, but if I can think of something else I'll be sure to come back and add it to this review. NOTE. I received a copy of this book through NetGalley, but all opinions are my own. My name is Giulia and I love reading. Giulia has read 0 books toward her goal of 100 books. All content is property of © GiuliaReadsBooks. Tema Semplice. Powered by Blogger.